ISKENDER KEBAB -Turkish dish (usually referred as Döner Kebab) is one of the most famous dishes of Turkey, and takes its name from its inventor, restaurateur Iskender Efendi. Back in 18 century in Turkey the lamb kebab was cooked above the charcoal fire horizontally. Iskender Efendi realized that each of his customers had different parts of the meat. Then, he began to think about a different way of cutting to serve his customers all parts of the lamb with a mixed taste. He came up with an idea to cook and cut it vertically. He cut off the bones from the meat and placed all of these pieces one on the top of the other on a vertical spit in front of the charcoal fire. By this way, all the different parts of the meat are mixed and formed a delicious taste. 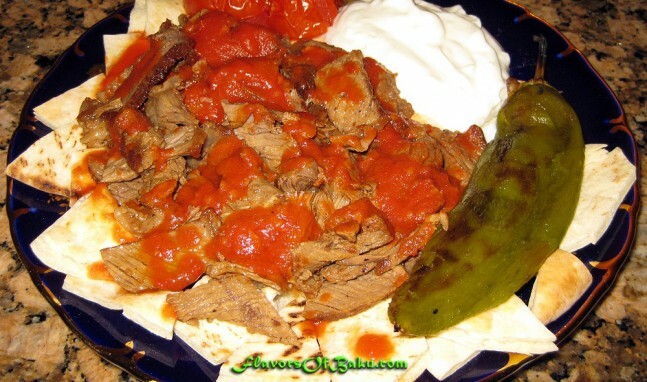 To make your own homemade Iskender Kebab try the recipe below. 1. Season the steak with salt and pepper. 2-3. Heat the skillet, add butter and fry the steak on both sides over medium-high heat until steak is done. 4. 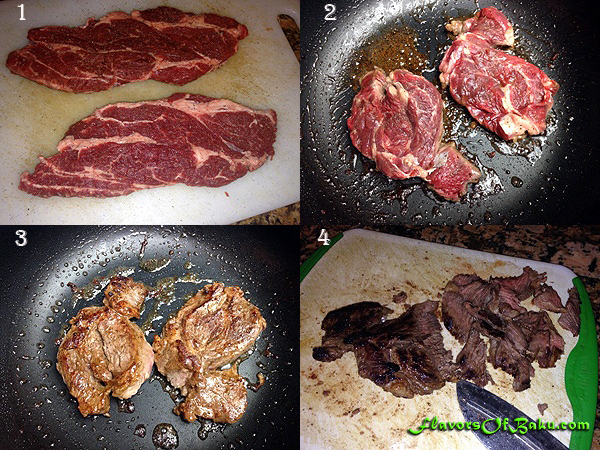 Take the meat out of the skillet, place it on cutting board, and slice it as thin as possible with a sharp knife into small pieces. 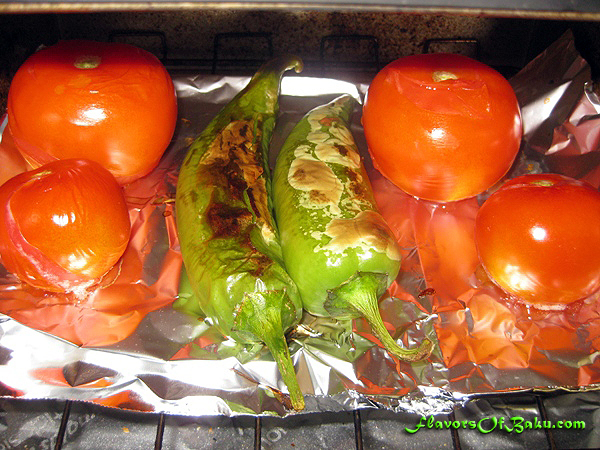 Preset your grill to medium-high heat (or preheat the oven to 400F, and grill tomatoes with the chili peppers. In a separate small saucepan prepare the sauce. 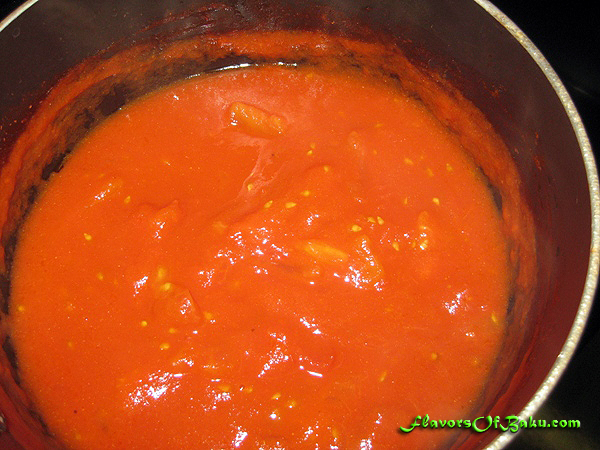 Add canned tomato sauce to the pan, add salt, pepper, one tablespoon of butter and two finely chopped roasted tomatoes. Cook over low heat for 5 minutes. Crush the garlic with the salt and add into the yogurt, mix well. Warm up the pita bread in a microwave or in the oven. 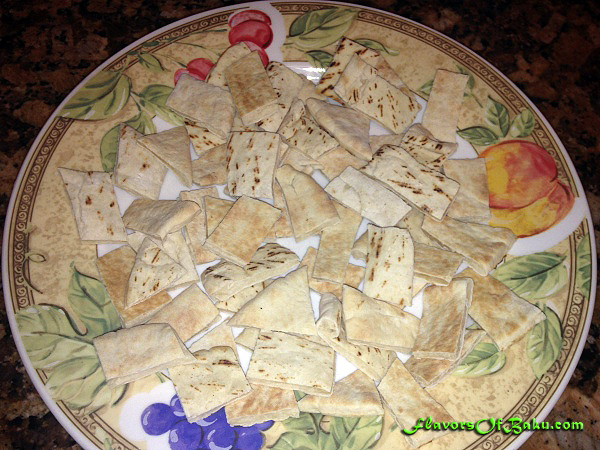 Then cut the pita in bite size diagonal shapes and place on the plate. Spread the beef over the pita bread pieces. Pour the tomato sauce on top and place a few spoons of yogurt on the side. Garnish with the grilled tomatoes and chili peppers. 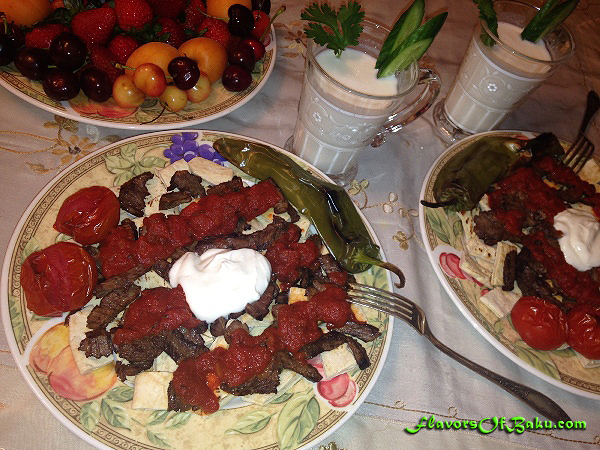 Serve Iskender Kebab while still hot with the cold drink Ayran (the yogurt-and-water drink).